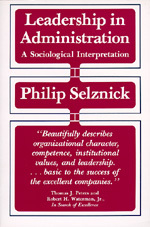 From the Preface:This essay outlines a perspective for the study of leadership in administrative organizations. It was written in the conviction that more reflective, theoretical discussion is needed to guide the gathering of facts that the diagnosis of troubles. This subject, like the larger study of government and society, requires our profoundest intellectual concern. We shall not find any simple prescriptions for sound organizational leadership; nor will it be purchased with a bag of tricks and gadgets. It requires nothing less than the proper ordering of human affairs, including the establishment of social order, the determination of public interest, and the defense of critical values. Thus conceived, our inquiry has ancient roots. The main problems and issues have been known for a long time, although they need to be restated for the purposes of administrative theory. Philip Selznick (January 8, 1919 – June 12, 2010) was professor of sociology and law at the University of California, Berkeley. A noted author in organizational theory, sociology of law and public administration, he wrote such books as The Moral Commonwealth, TVA and the Grass Roots, and Leadership in Administration.